Think you’re having a bad day at work? Take a look at these five warehousing fails that will make you cringe (and be thankful you weren’t there). We’ve also got some warehouse safety tips to help ensure that your warehouse runs efficiently. Without the right safety measures in place, a warehouse can be a dangerous place to work. In fact, Forbes Magazine lists warehousing as one of the top ten most hazardous jobs in the world, sustaining hundreds of fatalities every year. Unfortunately, accidents like these can cost you a fortune in damaged stock, equipment and injuries - so it’s imperative to give your staff rigorous safety training and have preventative safety measures in place to avoid accidents wherever possible. While a warehouse management system (WMS) won’t be able to prevent accidents like these, it will streamline your operations, helping you achieve your business goals. Contact us to find out how the right WMS will benefit your business. The following video demonstrates how quickly warehouse accidents can happen (thankfully no one gets hurt). Being stuck in the traffic this morning suddenly doesn’t feel so bad, does it? These poor men and women truly did have the worst day at work! While it’s impossible to avoid accidents entirely (they are accidents after all), proper training and safety procedures can help mitigate some of the risk involved in operating a warehouse. 1. Slips and falls are the number one cause of accidents in the workplace (not only warehouses). Train your staff to be aware of their surroundings when walking around the warehouse. Staff should avoid distractions like texting while walking. Installing slip-resistant floor protection is the best way to guard against these kinds of accidents. Additionally, keeping your warehouse floors clear of loose materials like sawdust and styrofoam, as well as mopping up spills immediately will help prevents slips. 2. Fires are one of the most preventable accidents in a warehouse. The biggest culprit of electrical fires in warehouses is cable spaghetti. If you’re guilty of the above, make sure you correct this as quickly as possible. If your warehouse is short on plug points, rather call an electrician to install more. 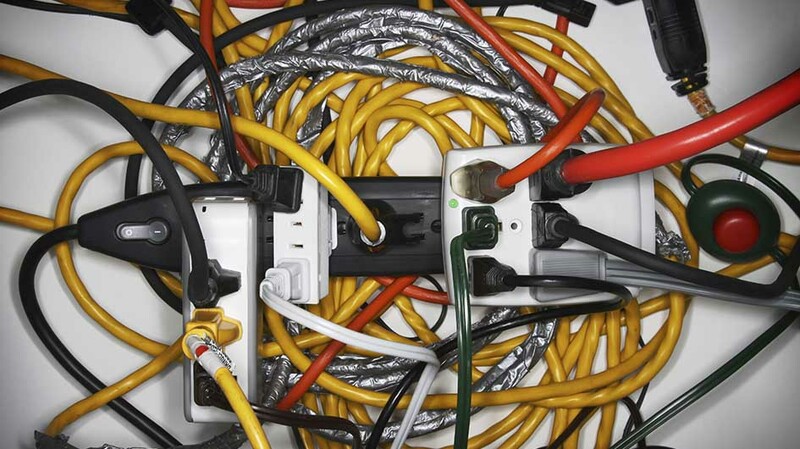 Don’t be tempted to plug multiple cords together, and never try to tape or nail extension cables to the floor. Not only does this damage the cables and create a fire hazard, but it also becomes a tripping hazard. 3. According to OSHA (Occupational Safety and Health Administration), up to two workers are crushed to death every month, by equipment or heavy stock. To avoid this, all staff should be cross-trained on how to operate equipment like forklifts, augers and press machines. Additionally, trucks and other vehicles should be limited to the loading dock. Heavy stock, supplies and materials should be stacked neatly to prevent the loads shifting and falling over. Try to avoid stacking these items too high and ensure that staff do not try to lift these items on their own. Avoid your own epic warehouse fails by ensuring your systems work well together. Learn why pairing order management with ERP will help you to meet the demands of omni-channel commerce.